When Malala Yousafzai fought for girls’ education in Pakistan, the world watched with baited breath, sympathizing with the brave girl who had risked her life to stand up to the Taliban’s mullahs. In Iran, such struggles take place all the time – not just for girls, but for minorities who are barred from accessing the same education and opportunities as Shi’ite Iranians who are in line with the country’s religious establishment. While Iran’s government-affiliated press is busy leveling accusations against European states over discrimination experienced by minorities, the Western World (and Press) seems less and less interested in the shameless discrimination against minorities in Iran, while Iran itself ignores calls by the UN to cease its minority rights violations. Minorities throughout the Middle East are suffering, paying the price for the sectarian rivalry between the Shi’ite and Sunni powers – and their respective proxies. In Iran, the Baha’i community, as a good example, is persecuted, scapegoated, and denied equal opportunity. Just recently, Iran sentenced a whopping 24 Baha’is to prison terms ranging between six to eleven years (193 in total). The charges? “Propaganda in favor of the Baha’i and the Islamic Republic,” simply by “being members of an illegal organization” – in other words, by belonging to the Baha’i faith, Iran’s largest religious minority. Simultaneously, Iran has been cracking down on Baha’i-owned businesses, adding more Baha’i establishments to its blacklist of banned business – while at the same time claiming Baha’is are not being actively targeted by the state. Meanwhile, on Iranian university campuses, Baha’i students are being singled out and deprived of higher education. 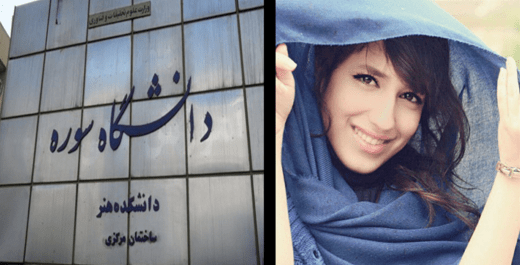 Most recently, Maedeh Khalili-Amiri, a female Baha’i student in Tehran, was expelled from Sooreh University just four months after registering. Khalili-Amiri was told by education officials that she was accused of disseminating propaganda – the same charge faced by the Baha’is who were sentenced to prison in northern Iran, simply for practicing their religion. Eventually, she was told that as a Baha’i, her “education rights only extend through high school and no more.” When she insisted that the Iranian constitution grants all Iranians the right to higher education, she was told the law was “null” in her case – as “You live in an Islamic country, so anything is possible.” Clearly, the UN’s Universal Declaration of Human Rights isn’t considered so universal in the Islamic Republic.